With her first solo show in Europe, the young Japanese artist Kei Takemura presents a series of works that she has created over the last two years which have been produced in Tokyo and Berlin. Both places inspire her and serve her as patterns for her partly large size embroidery pieces. Kei Takemura uses white shiny silk threads from Japan to embroider semi-transparent cloths in a Japanese embroidery technique for which she chooses motifs from these environments. These motifs are captured for a long time - silk is supposed to last a minimum of 1000 years. She also dedicates a lot of time capturing memory as in her piece "To Remember Grandmother’s House Better", 2004. Using her own memory and the memories of her family members she made a life size sketch of the former tea house in which her grandmother used to live during her last years. This building which no longer exists is now transferred in outlines on the wall in the gallery (450 x 290 cm) covered by a half transparent cloth with silk thread embroidery. The objects that surrounded the grandmother in her living room are tenderly recognizable on the fabric. This lengthy process unites Takemura’s memories with the memories of her family and appears as a pale imagination of a vanished house. 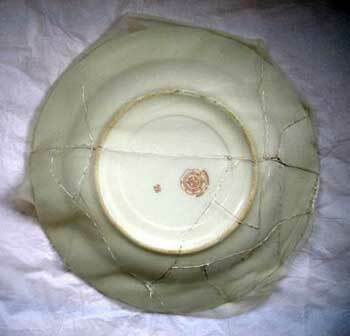 In her series of works, "Restoration", Kei Takemura attaches broken everyday dishes together and covers them with half transparent cloth. The points of fracture of the plates, cups, pots and glasses are transferred with white silk threads exactly into the fabric. Through the “wounds” of accidental fragmentation, the broken dish did not land in the dustbin, rather, Kei Takemura reinstates the objects’ validity through the embroided “bandage”. The embroidery of Kei Takemura captures ephemerality and often also that which is out of our field of vision, minor details like spots on the wall in the staircase, scraps of wallpaper from a former inhabitant of her apartment in Berlin. Kei Takemura takes pleasure out of small inconspicuous details and creates her original poetry of everyday life.